Nice little guide from the Guardian to Britain’s common garden birdsongs. Find out which birds sound like a bicycle pump or a squeaky trolley wheel and which can imitate car alarms. Put out feed regularly, especially in severe weather. Set up a bird table and use high calorie seed mixes. Put out hanging feeders for black sunflower seeds, sunflower hearts, sunflower-rich mixes or unsalted peanuts. Ensure a supply of fresh water every day. If it is very cold use tepid water but DO NOT use any antifreeze products. Put out fruit, such as apples and pears, for Blackbirds, Song Thrushes and other members of the thrush family. Food bars or fat hung up or rubbed into the bark of trees is a great help for Treecreepers, Goldcrests and many other species. Put up nest boxes to provide roost sites for the smaller birds. They will then be used for breeding later in the year. For those who don’t succumb to the charms of grey squirrels, keeping them off the bird feeder is a challenge. There are plenty of ideas on the forums, such as placing a table on top of a greased pole, or capitulating by scattering food on the ground to distract the squirrels and give the birds a chance. If unwanted rodents are consuming kilos of bird food, it might be worth investing in a specially designed squirrel-proof bird feeder. Those sold by the RSPB include conventional seed and nut dispensers caged within bars too narrow for a squirrel to pass through. Then there’s the robust–looking Squirrel Buster, which automatically closes down when something heavier than a small bird tries to access the food. It’s the most expensive option, but comes with a life-time guarantee. Not bad considering the fearless acrobatics and determined wire-chewing tendencies of squirrels. When a million-strong swarm of ladybirds landed on Blackdown Horticultural farm recently, every time the staff ventured outside they were coated in insects. But the red cloud brought good publicity for their enterprise: green roof installation. Wasp Hordes poised to invade British Gardens, Army of Flying Ants descend on Britain, Swarm of Millions of Ladybirds infests farm. It’s enough to make you flee indoors and hide, with all windows sealed shut. If you’re looking for wildflower seeds, an experienced supplier is Landlife, a registered charity who promote biodiversity. But they don’t simply plant wildflowers. Firm believers in nature’s power to heal and uplift, Landlife strive to improve the environment for people’s wellbeing, focusing particularly on deprived areas. You can support their work by ordering fabulous mixtures of wildflower seeds, or making up your own combinations. They are experts in large-scale conservation projects, as well as transforming small gardens, even balconies. The photograph shows their classic best-selling Cornfield mix. Read about their products and projects. The Guardian has drawn up the shortlist for its 2009 Garden wildlife photography competition. 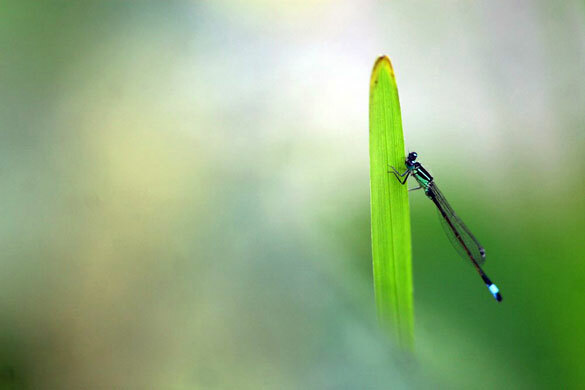 Photo above is of a Blue-tailed damselfly by Kate Fuller.